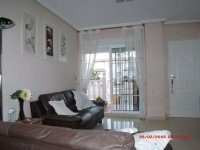 VILLAS AND APARTMENTS TO RENT IN CABO ROIG, SPAIN. 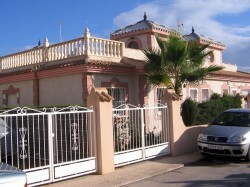 Welcome to our selection of holiday homes to rent in Cabo Roig, Spain. Cabo Roig is a small Costa Blanca resort that has become very popular with British ex-pats looking for a new life in the sun. There are no large hotels in the town, with most of the holiday accommodation provided through apartment rentals and time shares. You are unlikely to find many Spaniards holidaying in this resort and subsequently many of the bars and restaurants are aimed at the British market � one of the most popular is the Queen Victoria which holds bingo and quiz nights every week and serves fish and chips and curries! The main reason to come to Cabo Roig is for the beaches and the year-round sunshine. There are two beaches actually in the town, Cala Caleta next to the small marina and Cala Capitan on the other side of the headland. These do get very busy in the summer months, especially on a weekend, so if you are prepared to travel a little further afield to find some quieter stretches of sand, there are other options in the region. North of the town there are a number of rocky coves which are quieter and more secluded and there are even naturist beaches in the Guardamar dunes and in the nearby resort of Calblanque. Calblanque is also an ideal destination for those who aren't really sun worshippers, as the forest that backs right onto the sand dunes has networks of footpaths and cycles paths to explore in the shade. In the winter, Cabo Roig is very quiet, with many bars and restaurants only open on weekends or for a few hours each night. But in the peak season, the resort really come alive with beach bars and nightclubs to keep party animals entertained until the small hours of the morning. Don't forget that most of the British bars will serve a full English breakfast to help you get over your hangover. As well as the Queen Victoria pub, there is also the Med Bar which shows most live English football matches and the Bushwacka which provides live music on its outside terrace most nights during the summer. Shopping is mainly on the practical side, with plenty of facilities for those who are self catering to buy food and drink. There is now a weekly market in Cabo Roig which not only sells fresh produce and specialities, but also some local crafts. Looking for self catering holiday accommodation in Cabo Roig? Then below is a selection of apartments in Cabo Roig and villas in Cabo Roig that can be rented direct from their owners. You can either click on each listing for further details or you can use our search engine on the left if you are looking for something in particular.